Sending a simple thank you letter goes a long way in strengthening strong and long-lasting business relationships. You might write to a hard-working employee that shows dedication and commitment to your business. Or you might write to a loyal customer who continuously repeats purchases with you. Whoever you want to thank, it doesn’t matter. Expressing your gratitude in writing makes the recipient feel good. And, by doing so, you nurture continued loyalty to your business. Sending out thank you letters to customers, clients and colleagues becomes a powerful way to secure an ongoing business relationship. Showing gratitude in turn encourages your top customers to sing your praises to others. This could happen through online reviews, on social media and through word of mouth. An estimated 62% of consumers search online reviews and information before purchasing a product. So the importance of sending a thank you letter becomes clear. If you find yourself unsure how to compose a thank you letter, don’t worry. 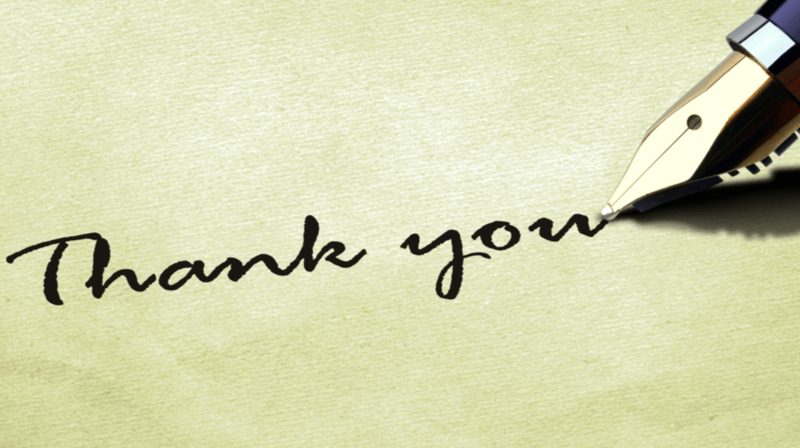 Take a look at the following 5 best thank you letter examples. Show your customers you are grateful for their business. And subsequently encourage them to keep doing business with you instead of going elsewhere. Sending your faithful customers a thank you letter cements your business relationship. Thank you letters become even more appreciated by customers if they offer a reward. For example, try offering a discount voucher. Such rewards act as a lucrative incentive for customers to purchase from you again. On behalf of [insert company] I would like to say thank you for being a loyal customer. It has been a pleasure serving you and supplying you with [insert appropriate products or services] and we hope that we can have the pleasure of providing for you for many more years to come. [Name of business] is committed to providing our customers with only the highest quality of [name of products or service] delivered through impeccable customer service. As proof of our appreciation for your loyalty and ongoing support, we would like to give you a 20% voucher off your next purchase with us. Once again, thank you for your ongoing business and we look forward to serving you in forthcoming months. Quality, hard-working and dedicated employees don’t grow on trees and should be thanked to show that you recognize their hard work and loyalty. Sending a thank you letter is a personal, simple and cost-effective way to show your recognition and appreciation of your most prized company assets. I would like to say thank you for all your hard work this year. We couldn’t have got where we did this year without your ongoing dedication, commitment, creativity and talent. Since joining the business in [year] you have gone from strength to strength and are a true asset to our company and our clients. I look forward to working with you for many more years to come. The run up to the Christmas vacation can be the perfect time to send your regards and best wishes for the holiday season and the New Year to colleagues, clients and customers. If you’re struggling with the right words to use on a festive thank you letter, here’s template you might want to use. As the festive season approaches, on behalf of [name of business] I would like to say thank you for all the support and commitment you have shown to us in the last 12 months. You are an exceptionally valued [member of our team/customer/client] and I would like to send my personal thanks for your continued support. We consider you as a friend of [name of company] and extend our warmest wishes for good health and festive cheer. It is people like you that have helped our business get where it is today. I hope you and your family have a magical Christmas and a Happy New Year and I look forward to doing business with you next year. The arrival and prolific growth of remote, digital forms of communication has not stamped out the yearning for personal, face-to-face meetings. In fact, research shows that around 9 in ten people say small meetings are their favorite method of communication. For clients that have taken the time and made the effort to visit your business, it is important they are adequately thanked. On behalf of [name of company] I would like to thank you for taking the time to visit us on [date of visit]. We felt the meeting was extremely valuable in getting to know you better and securing some solid goals on how we are going to proceed with the campaign [or type of service] in the forthcoming months. We hope you got as much out of the meeting as we did. I look forward to our next catch up and, in the meantime, if you have any questions or queries, please don’t hesitate to get in contact with one of our team. Customer service departments can be the backbone of a business, the department that often gets the most flack and the least rewards. As a valued and hard-working member of our customer services department I would like to thank you for all your hard work and being such a key face behind our company. The business has had great reviews and feedback in recent months, positivity that has been driven by our always-smiling and never flustered customer services team. You are a vital member of our customer services department and I would like to say thank you and hope you remain part of the team for a long time to come. Once again, thanks for your hard-work and commitment in what I know isn’t always an easy job.